Braving wind, rain, snow, sleet, and cold, two eights from the boys and girls squads are spending five days of their spring break vacations training for the upcoming racing season. These practices on the Charles River in Boston are the first on-the-water strokes anyone has taken since the end of the fall season in October. They build on the indoor exercises, tank rowing, and erging done during the pre-season week before spring break while crews waited for the last few inches of ice to melt from the Squamscott River. Due to an Academy regulation, the actual Exeter crew coaches are not allowed to attend spring training. Instead, Marshall Moore, former Exeter Girls Varsity coach and father of boys co-captain Tim Moore ’08, is coaching the two boys eights out of Newell Boathouse at Harvard. Julia Chilicki, former Olympian and member of the U.S. National Team and 1998 winner of the Championship Singles at the Head of the Charles, is coaching the two girls eights out of Weld Boathouse at Radcliffe. 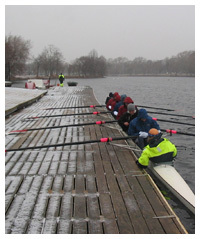 On Wednesday, I had the luck of going in the launch with Coach Moore during a “wintry mix” of snow, sleet, and rain. Despite the wetness and 35° temperatures, the crew showed noticeable improvement over the practice while Coach Moore corrected their form and tinkered with lineups. Co-captain Tim Moore ’08 said that “people are definitely happy to be here. Without this week of training without schoolwork or other things to worry about, people return to campus mentally ready for crew.” Moore also thought that “all the boats boats have definitely improved in the the last couple days.” Check out the photo gallery here for all the photos from the boys practice on Wednesday. Across the river at the girl’s practices, co-captain Allison Courtin ’08 said that she is very encouraged by the energy and focus shown by both boats. “People are really responsive to Coach Chilicki. It’s really good to have a different perspective about things each of us have to work on.” She added, “[Spring training] is a good way to get everyone going and row with all your friends without the pressure of impressing coaches or making a certain boat–I think it’s a great way to start the season.” When asked about the potential for a “three-peat” following two straight years of NEIRA Championships for the girl’s first eight, Courtin said “I definitely don’t want to jinx it…but I am cautiously optimistic that right now we are looking to be at least as fast as we were in the last two years.” Check out the photo gallery here for all the photos from the girls practice on Saturday. All crews have four weeks until the first race on April 19th against Andover, St. John’s, and a few other schools at Lake Quinsigamond in Worcester, Massachusetts. Check back later for more information as this date nears.